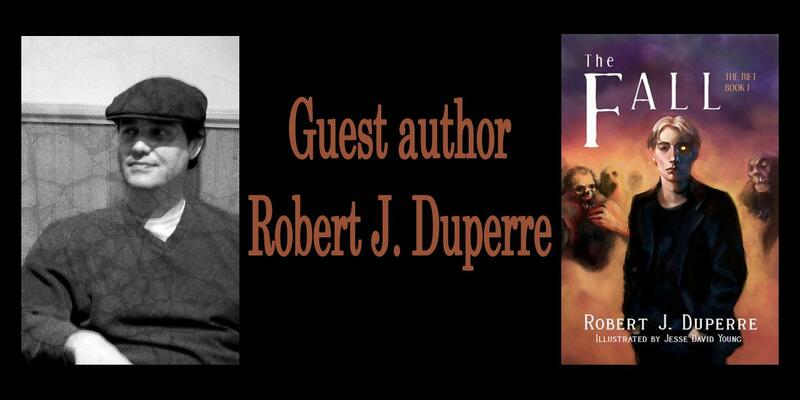 Please welcome today's guest author Robert J. Duperre! Robert is the author of The Fall (The Rift, #1) and contributed to The Gate: 13 Dark and Odd Tales . Robert: It all started as a kid. I used to spend a lot of time alone in my bedroom (sometimes forcibly), and I used those hours to write and draw comic books. Once I hit high school, I'd gotten the bug. I used to write thirty page English papers like they were nothing. Of course I got A's on them - probably because the teacher got tired of flipping page after page when they had so many other papers to correct. Combine that with my love of Clive Barker, Anne Rice, and Douglas Adams, and a writer was born. Robert: The mystery of life intrigues me. As a younger adult, I considered myself an atheist - until, that is, that I realized how much I longed for the spectacular, for the mystical. Paranormal is special for another reason, as well. It allows us to create situations that are real-world equivalent and place them in the realm of the fantastic. This creates a needed buffer between the occurrences on the page and world the reader exists in. It allows the story to tell its tale, to send a message from a safe distance, which is paramount to engrossing the audience and not alienating them. Robert: I'd probably want to be a vampire - for the immortality. I'm (ahem) scared to death of death. The only problem is that I'd have to turn my entire family into vampires, as well. I wouldn't want to go through eternity alone. Robert: The Fall is dark, scary, and sometimes graphic, but it also has a huge heart. The characters are believable and flawed, folks we can relate to and root for. The story is simple on the surface but more complex once a few layers are peeled back. There is terror, angst, a sprinkle of romance, zombies, and a mysterious evil force. Who could ask for more? For Josh and Kyra, the two primary characters, I'd have to go with Paul Dano (the son from Little Miss Sunshine) and Jaime Ray Newman (Kat Gardner from the television version of Eastwick.) I have Dano in there because a) he's the right age, and b) he has that quiet, intelligent feel to him and is an obviously attractive guy, but not perfectly so. As for Newman, she's also the right age, and she has a glow about her. I'd love to see her dirtied up a bit for the role. I think she'd nail it. As for my mysterious leader of the dead? It'd definitely be Julian Sands. He was the inspiration for the character, so it'd be sublime to have him in the role. 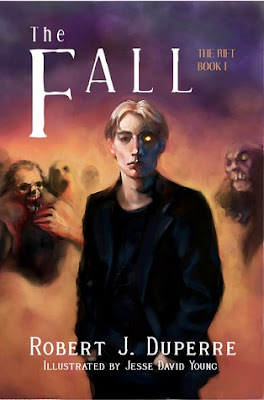 The Fall (The Rift, book 1) by Robert J. Duperre. An ancient evil, trapped in the ruins of a lost Mayan temple for centuries, has been unleashed. It takes the form of a deadly virus, one that causes violent insanity in the living and the recently departed to rise and walk. It spreads around the globe, throwing the world into chaos and war. As it progresses, those in the States who find themselves far away from the epicenter watch it unfold with unbelieving eyes. From Washington D.C. to Dover, New Hampshire, regular people are hurled into an existence outside their control, left to deal with catastrophic situations that they find themselves unprepared to handle. Life becomes a nightmare, and that nightmare is spreading. Thank you Robert for joining us here today at From the Shadows! 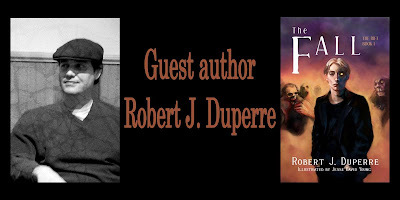 To learn more about Robert J. Duperre and his books, please visit his website. Thank you, E.J., and hello to all you out there! Unfortunately, I'm heading off to work and won't be back until later this eve, but I'll hopefully have my partner and artist, Jesse, swing by for a bit. Great interview! It was very intreguing. I have a question of my own actually hehe. I was wondering, Robert, did you ever envision yourself being where you are today as a writer? or as you were growing up, did you think you were destined to be something else rather than a writer before you became one? I always envisioned myself as a writer but I never thought this would be the road taken. Life gets in the way sometimes and I had a ten year drought in the middle of my life but things always turn around, so I guess I am where I'm supposed to be. Thanks for asking! No problem and thank you for your answer :).